A. The UK is a service economy: about 80% of income is generated by service sectors and 45% of UK exports are cross-border services trade – by a long way, the highest proportion for any major economy. B. British politics and media are locked in an intense debate about the future trading relationship between the UK and the EU. This hinges around whether the border between Northern Ireland and the Republic will permit frictionless trade in goods and it is spiced with concerns about how parts of the car industry might gradually leave the UK under a ‘No deal’ Brexit. The absence of a border in Ireland is critical to the Irish Peace Process, and frictionless manufacturing trade, with the EU and the world, is important for the UK’s overall prosperity and for providing good jobs in less affluent parts of the UK. So both are important objectives. However, the lack of attention paid to service sectors by the Government is both staggering and potentially economically costly. ‘36. The UK and the EU will also cooperate on regulation, in a way that preserves regulatory flexibility for the UK, which is important for the UK’s services-based economy. Compared with the strong verbs the Political Declaration uses for goods trade – e.g. ‘have agreed’, ‘have committed to create a free trade area, which combines deep regulatory and customs cooperation’ this weak language suggests that the UK Government is quite reconciled to a regulatory divergence with the EU which will significantly hinder services trade. Why is the Government so sanguine about the country’s major economic activities? Partly it has to be: having committed to very close alignment in goods for Northern Ireland, services is the only sacrifice left as a quid pro quo for curtailing the free movement of labour. But also, so far as one can ascertain, it believed the myth promoted the Brexit-ultras like Michael Burrage of BrexitCentral that ‘The EU single market in services barely exists’, and that the UK never gained much more access to EU services markets than it would have received under EU rules for trade with third countries. This dismissive view never was very credible – as UKTPO pointed out in a variety of places – but now we have firm evidence. In July 2018, the UKTPO conference heard that OECD had found that market access under the Single Market was substantially better than that available to third countries, which is what Britain will become after Brexit. And even if the Withdrawal Agreement is approved, third-country status will be the starting point for the negotiations that subsequently occur. Since services trade agreements only very rarely get beyond consolidating existing actual third country access (UKTPO Briefing Paper 24), that is pretty much where the UK will remain after negotiations finish too. The OECD’s research has now been published in “Intra-EEA Stri Database: Methodology and Results”, by Sebastian Benz and Frederic Gonzales, along with a calculator that allows one to make the relevant comparisons oneself. combine the scores from each policy area using sets of weights that vary from sector to sector. Details of the process are here. The method and weights are identical for the MFN and the intra-EEA calculations and in both cases the resulting indexes range, in principle, from 0 (totally open) to 1 (totally closed). The detailed results are important for sector leaders and policymakers and should command their immediate attention. Here, however, I focus on the overall message, which is captured by Figure 1. Reproduced from Benz, S. and F. Gonzales (2019), “Intra-EEA Stri Database: Methodology and Results”, OECD Trade Policy Papers, No. 223, OECD Publishing, Paris. First, across all sectors, intra-EEA trade is significantly freer on average than MFN services trade. The average intra-EEA restrictiveness index is 0.06 for the 25 countries covered, while the mean across MFN regimes for the same countries is 0.22. At a sectoral level, for example, computer services have an intra-EEA index of 0.04 compared with an MFN one of 0.22. The corresponding figures for air transport are 0.15 and 0.42 and for legal services 0.08 and 0.37. Second, the wedge between intra-EEA and MFN regimes is particularly large when (i) sectors are outside the realm of the multilateral trading system (air transport) or are not negotiated with any seriousness (maritime transport), or (ii) in regulation-intensive sectors, notably legal services but also such sectors as engineering, architecture or computing services. These are high-skilled professional business services, the international exchange of which has evidently been greatly facilitated by the Single Market. Comparing Figure 1 with the EU-Canada deal (CETA), arguably the EU’s most ambitious FTA on services, is revealing about the prospects for key UK service exports post-Brexit. For legal services, in which the Single Market makes a huge difference, EU member states registered a large number of restrictions on Canadian suppliers (UKTPO Briefing Paper 18). For financial services, where UK banks currently benefit from passporting arrangements, Canada’s market access under CETA is limited to a small selection of cross-border services, which, except for insurance intermediation and portfolio management, is basically identical to the EU’s MFN commitments in the GATS. 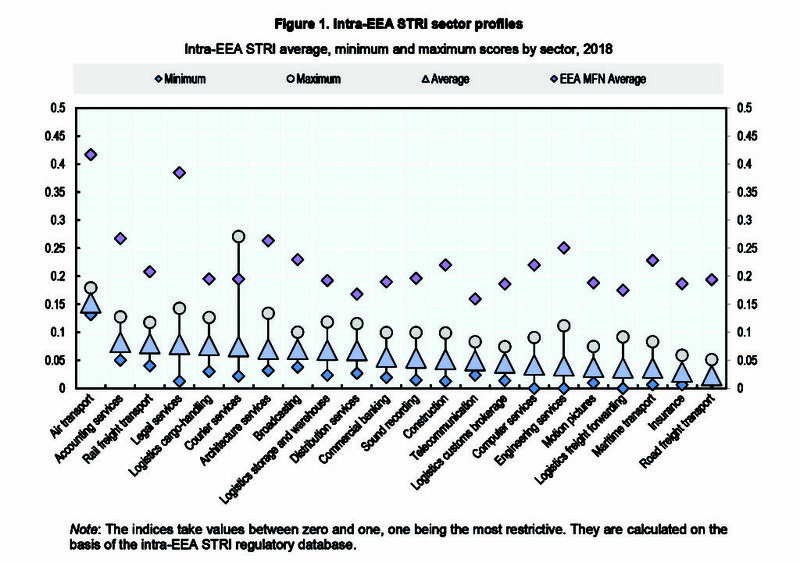 Third, the variance of applied regimes across sectors is much less for within-EEA trade than for EEA countries’ MFN regimes (especially if one excludes air transport, the most restrictive of all sectors). Differences in protection between sectors are particularly important economically because they distort the pattern of production away from the sectors in which an economy is naturally most competitive. A fourth key message, not evident from Figure 1, is that the European Single Market has not only reduced barriers to services trade within the EEA, but it has also harmonised regulations across member states. This is important because the costs and barriers to services trade arise at least as much from the differences in regulations between exporter and importer and across export destinations as they do from restrictive regulations per se. Specifically, for all pairwise comparisons between EEA countries, OECD has recorded whether, measure by measure, they have similar regulations, scoring 0, or dissimilar ones, scoring 1. The average over all comparisons and sectors is 0.06 for intra-EEA trade compared with 0.22 if these countries had traded according to their MFN policies – a huge difference. Moreover, the study reminds us, as UKTPO Briefing Paper 6 had noted previously, that as the UK tries to negotiate mutual services trade liberalisations with the EU, it will need to deal with each member state separately because they have different policies. The failure to address services has characterised virtually all the alternative Brexit proposals that have received attention. Only variants of the “Norway” option come close to giving services trade the priority it demands. This particular act of national carelessness will soon come home to haunt us. Many thanks for writing this informative blog. As a SaaS (software as a Service) provider, it seems very unclear as to the impact of Brexit on our sales to the EU. Apart from a potential downturn, there are likely to be many administrative changes which will cost the business. Ironically, since we actually help business reduce costs and streamline procurement, it might actually increase our business within the UK but at this moment we are looking to grow internationally (60% of our revenue is outside the UK and a significant proportion within mainland Europe) and we hope our business will not take a significant hit from sales within the EU. We also hope the government will address these concerns before the final outcome.